Tom first embraced pottery in South Korea in 1971-72 where he was stationed as a captain in the US Air Force. His teacher was a famous potter named Angelo Garzio specializing in Raku ware, a type of Japanese pottery customarily used in tea ceremonies since the 16th century. Raku means ‘enjoyment,’ ‘comfort,’ or ‘ease’ and it is traditionally characterized by being hand-shaped rather than just thrown – exactly what drew Tom to this craft. After a bowl is removed from the wheel it sits under plastic all night or even two days before it is ready for carving and designing. Tom uses a torch to prevent the wet clay from sliding and falling while fashioning the decorative touches with his fingers. It reminds one of making a decorative edge to a pie crust; this just takes a more talented touch. Then there is the complex process of finishing the piece. Raku uses the unique low-firing bisque process which is only 1700-1800°. This is the practice of pre-firing ware without glaze to make it impervious to water, resistant to damage during handling, and absorbent for glazing. Tom dabs under-glazing on the design, then does bisque firing, then glaze is applied, and the piece goes back in the kiln for another firing. “It’s alchemy,” Tom says. He’s not kidding; it is complicated and uncertain, and has many variations. It takes almost a month to do everything. 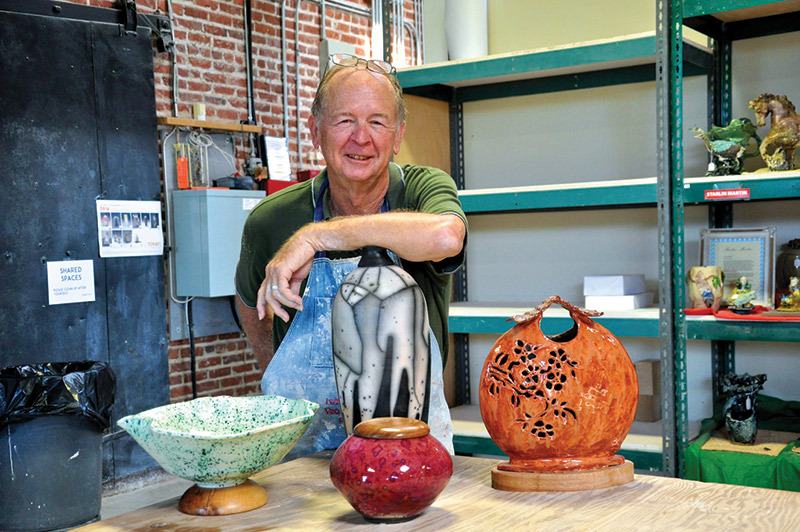 Tom formulates his own glaze colors, and what he chooses depends on whether the piece will be low-fired or high-fired. 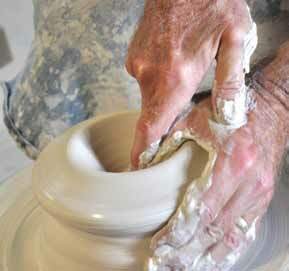 There are also 50 to 100 types of clay from which to select and he has his favorites. Raku are somewhat porous vessels because of the low firing temperatures, the lead glazes, and the removal of pieces from the kiln while still glowing hot. In the traditional Japanese process, the fired Raku piece is removed from the hot kiln and is allowed to cool in the open air. 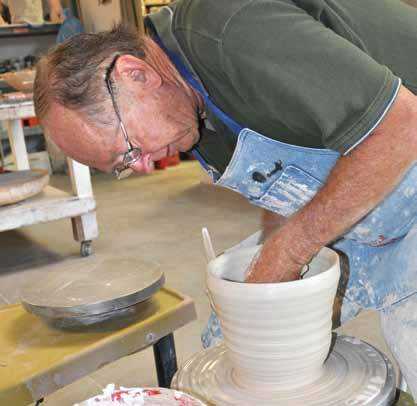 Here at the Morean Center for Clay, the familiar technique of placing the ware in a container filled with combustible material is not a traditional Raku practice, but a technique that has been modified by contemporary potters worldwide. 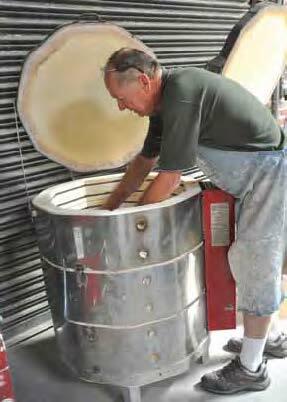 There are many types of kilns at the Center, including wood fire, salt, soda, gas, and electric kilns. Do you know that a wood fire takes five days at 2400° to complete firing the vessels? On the other hand, according to Tom, the electric kiln fires up for eight to ten hours, then it takes about two days to come back down. Tom isn’t satisfied with just creating a bowl. It has to have a stand, and that gives it some stability as well as a beautiful display. But, it’s not just any stand. Oh no… Tom also hand-carves wooden bases for the clay pieces using all types of local reclaimed wood. His garage is quite the workshop, complete with a band saw, a drill press, a sander, a British-made Myford lathe, and several chisels – some old, some from England. He also works with the wood creating decorative wooden platters, highlighting the wood grain with small touches of colorful melted semi-precious stones. While visiting Tom’s garage, another creative talent is discovered – Tom ties fishing flies! Tom loves fly fishing. 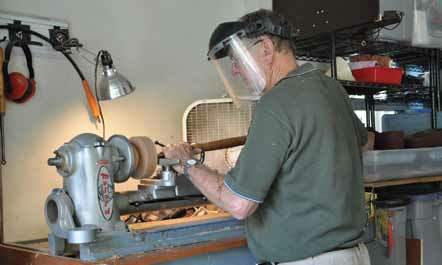 He has been trout fishing all over the world and he has a boat that he has outfitted by hand. You can see him fishing locally, too. 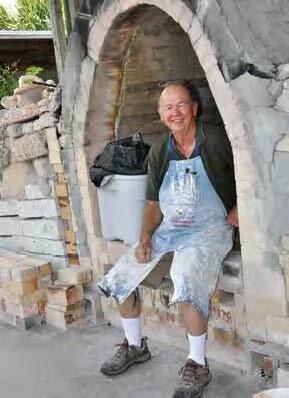 It’s been a long road (44 years, 10 countries, and 6 states) to where he is now with his pottery. 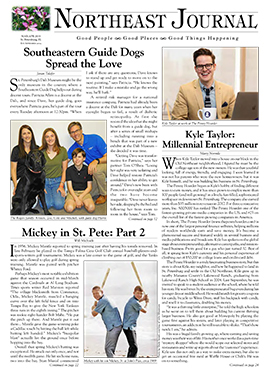 But, he has found his home in the Old Northeast and at the Morean Center. Tom and his wife, Karen, moved here four years ago after visiting their Foreign Service friends in the area several times. They drove through Granada Terrace, saw a house for sale, met the owner who lived next door, and they’ve been here ever since. Yes, it’s a long road. Tom grew up on a turkey farm in Missouri and decided to join the military in 1949. While working on the farm and “walking from the turkey coop with a bag of poop,” he caught a glimpse of his uncle in military dress and said to himself, “That is what I want!” He graduated from the University of Iowa and joined the US Air Force in July of 1963. His assignments included Vietnam, South Korea, California (2), Texas, Ohio, Colorado, Germany (2), and Hawaii (2). Tom sells his pottery bowls, vases, and lanterns at the Morean Center for Clay studio for anywhere from $65 to $135. They are also available, as are the platters, at Florida Craft Art (formerly Florida Craftsman Gallery) on Central Ave. Does Mr. Davis (Tom) do commission pieces? I would love to have a piece made for a friend of mine who admires his work.